I have been waiting for the La Mer concealer for several years. My love affair with La Mer started with an introduction to the foundation. I quickly got hooked and became a La Mer addict. I have gone through dozens of foundation bottles, three huge jars of powder and countless sample jars of the moisturizer. I am a glutton. I have not been entirely patient with waiting for this beauty product. I might have cussed them out a few times. I might have whined. I might have begged. But I am here to report that is worth the wait. This concealer is magnificent. It accomplishes many feats. It disguises dark circles without looking dry or cake-like. This is the main complaint I have with YSL's Touche Eclat. La Mer's concealer did not settle into my creases or my laugh lines. I refuse to call them wrinkles. I might be fooling myself....but humor me. There is always science behind La Mer products. The Max Huber Research Lab created this concealer with a cocktail of gemstones, an Asian mushroom and polymers. Sounds trippy but it the results are pretty fabulous. Tourmaline and malachite gemstones capture light energy to instantly conceal dark circles and blemishes. That is the smoke and mirrors effect I am always gushing about. The shroom is called Viapure Poria. This ingredient is used to calm and soothe the skin. There are also appearances from chamomile extract and various other plant and marine extracts. The rock star in this recipe is a unique polymer mesh technology. 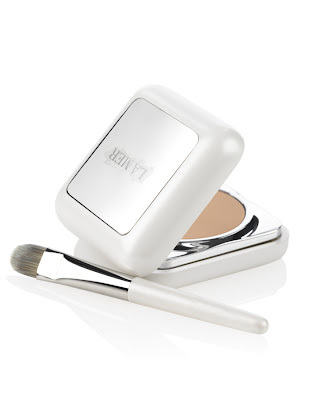 This delivers a diaphanous layer to create a crease-resistant finish. This is where this concealer differs from all others. You can build on it without it going cakey. It brightens, looks fresh and natural. Coverage is not lost. It will cover your skin like no one's business! This is a massive gush and rave. You must visit your local La Mer counter to give it a test drive. It retails for $65 and comes in a compact with a kid leather case. It comes with a brush and a SPF of 25. I like the idea of this concealer, but I replace mine every few months, so I prefer to buy a less expensive one, like Smashbox, which works really well. la mer is too expensive for skin basics IMO. but i have been wondering about this. dear old MIL is a LM fan so i am going to tell her the great news. thanks a lot! Does it contain mineral or Petrolatum? LM is notorious for charging high prices for mundane ingredients. Jojoba: Your MIL will flip. It is beyond fabulous. Well worth the years of waiting. Joy: I will have to check to make sure. I paid attention to only the quirky ingredients and the polymers. I wanted to love this, but sadly there's no color match for me =( I've been all about Paul and Joe lately, actually! Well darn it now I have to have this! I keep thinking I have to get Cle de Peau's concealer but I think it's drying but I am so sick of my circles showing through concealer! I will have to cave on this! isn't touche eclat more of a highlighter than a concealer? thank goodness, i don't really need concealers! but i might check this out! i like prescriptives, when i want to use something under my eyes (which i do normally, but i don't really need 'concealer' so to speak), that and a brush would be about $ 55 + right? A great review, Annie, and I agree 100%. This is flat out the best concealer I've ever tried. I'm tossing any and all remaining concealers. What I love the best is how it melts into the skin and leaves a bit of a healthy glowy appearance. The tiniest amount is all you need! I can see this little pot lasting me a very long time. We've waited over 3 years for this, and it was worth the wait! The search is over. Joey: That was on thing that I forgot to mention! There are only three shades. That is a drawback that needs to be mentioned. Twiz: You gotta try it out! It is very natural coverage with a nice moisturizing feel. That is what I like! P: I was wondering if you fell in love with this one too. This is such a life saver with my red nose. It covers it soooooooo well. Questions: if you have acne prone skin will it cause breakouts? Also, how does it compare to the HG concealer from Cle de Peau? Jenny: No breakouts for me. I still have to do research on the ingredients. In comparison to Cle: The texture is lighter and less drying. However...La Mer coverage is pretty fab too. You use less...and the polymer mesh system makes it not settle into lines or creases. I love this concealer! It is on the pricey side, but you do get the brush with it. I am quite fair, but still have a hard time finding a HG concealer as they tend to turn darker on me. I can only use the famed Cle de Peau when I am self-tanning or on certain hideous zits which would be highlighted by "matching" concealer. The La Mer can be used pretty much everywhere on your face. If you say this is good I will go and try it, I used to love the foundation with the concealer on top a couple of years ago. I used up all the concealer way before the foundation got to half. A separate concealer is perfect. I use YSL touche eclat but it makes my eyes hurt! i tested this out at the la mer counter and sadly it was either way too bright or too dark. And it def did not hydrate my eyes so it accentuated any dryness I had. Although, I did walk away from the la mer counter with the famous moisturizer and I love it!